Joe Hill, the acclaimed, award-winning author of the New York Times bestsellers Heart-Shaped Box and Horns, plunges you into the dark side of imagination with a thrilling novel of supernatural suspense that will have you flinching at shadows and checking the rearview mirror again and again. . . . NOS4A2 Don't slow down Victoria McQueen has an uncanny knack for finding things: a misplaced bracelet, a missing photograph, answers to unanswerable questions. When she rides her bicycle over the rickety old covered bridge in the woods near her house, she always emerges in the places she needs to be. Vic doesn't tell anyone about her unusual ability, because she knows no one will believe her. She has trouble understanding it herself. Charles Talent Manx has a gift of his own. He likes to take children for rides in his 1938 Rolls-Royce Wraith with the vanity plate NOS4A2. In the Wraith, he and his innocent guests can slip out of the everyday world and onto hidden roads that lead to an astonishing playground of amusements he calls Christmasland. Mile by mile, the journey across the highway of Charlie's twisted imagination transforms his precious passengers, leaving them as terrifying and unstoppable as their benefactor. And then comes the day when Vic goes looking for trouble . . . and finds her way, inevitably, to Charlie. That was a lifetime ago. Now, the only kid ever to escape Charlie's unmitigated evil is all grown up and desperate to forget. But Charlie Manx hasn't stopped thinking about the exceptional Victoria McQueen. On the road again, he won't slow down until he's taken his revenge. He's after something very special—something Vic can never replace. As a life-and-death battle of wills builds—her magic pitted against his—Vic McQueen prepares to destroy Charlie once and for all . . . or die trying. . . . Joe Hill's acclaimed works of fiction, Horns, Heart-Shaped Box, and 20th Century Ghosts, have already earned him international acclaim. 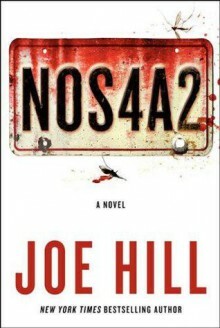 With NOS4A2, this outstanding novelist—"one of America's finest horror writers" (Time magazine); "a major player in 21st-century fantastic fiction" (Washington Post)—crafts his finest work yet. Disturbing, mesmerizing, and full of twisting thrills, Hill's phantasmagoric, devilishly playful masterpiece is a terrifying high-octane ride. 3.75 starsI have a few mixed feelings about this book. At times it felt like an adult horror. I really got into certain scenes. Other times, it felt like more of toned down horror, like it was aimed at a younger audience maybe. Overall, I did enjoy it.